Whatever name you use—check-up, well-child visit, or health supervision visit—these are important. The benefits of well-child visits include tracking your child’s growth and development. Your pediatrician will review your child’s growth since the last visit and talk with you about your child’s development. These visits are a time to review and discuss each of the important areas of your child’s development, including physical, cognitive, emotional, and social development. Pediatricians often use a resource called Bright Futures to assess and guide discussions with parents about child development. Parents can access Bright Futures to review information relevant to their child’s age using the website at the bottom of this page. Another benefit of a well-child visit is the opportunity to talk about prevention. For many children in the United States, the most common cause of harm is a preventable injury or illness. The well-child visit is an opportunity to review critical strategies to protect your child from injury, such as reviewing car seat use and safe firearm storage. The well-child visit is an opportunity to ensure your child is protected from infectious diseases by reviewing and updating his or her immunizations. If there is a family history of a particular illness, parents can discuss strategies to prevent that illness for their child. Healthy behaviors are important to instill at a young age, and the well-child visit is a time to review these important behaviors, such as sleep, nutrition, and physical activity. During the teenage years, well-child visits offer adolescents an opportunity to take steps toward independence and responsibility over their own health behaviors. Every well-child visit with a teenager should include time spent alone with the pediatrician so that the adolescent has the opportunity to ask and answer questions about their health. Adolescent visits provide an opportunity for teenagers to address important questions, including substance use, sexual behavior, and mental health concerns. Physical examination and screening tests are also a part of the well-child visit. Your child’s visit may include checking blood pressure level, vision, or hearing. Your pediatrician will do a physical examination, which may include listening to the lungs and feeling the abdomen. Screening tests can include tests for anemia, lead exposure, or tuberculosis. Some screening, such as for depression or anxiety, is done using a paper form or online assessment. Ideally, schedule the visit ahead of time so that there is time to complete any required school or sports forms. Some parents schedule these visits to correspond with their children’s birthdays, while others schedule these during summer months to prepare for the start of a new school year. Make a list of topics you want to discuss with your child’s pediatrician, such as development, behavior, sleep, eating, or prevention. Bring your top 3 to 5 questions with you to the visit. As your child gets older, ask your child to contribute any questions he or she would like to ask. When going to the visit, it may be helpful to bring your child’s immunization record, a list of questions, or any school or sports forms you need completed. 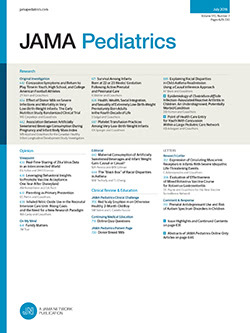 The JAMA Pediatrics Patient Page is a public service of JAMA Pediatrics. The information and recommendations appearing on this page are appropriate in most instances, but they are not a substitute for medical diagnosis. For specific information concerning your child’s medical condition, JAMA Pediatrics suggests that you consult your child’s physician. This page may be photocopied noncommercially by physicians and other health care professionals to share with patients. To purchase bulk reprints, call 312/464-0776.